This article originally appeared in Initium Media in Traditional Chinese and is reprinted with permission of the publisher. Initium Media editor’s note: In August, the United Nations Committee on the Elimination of Racial Discrimination reported that more than one million Uyghur people may be secretly imprisoned by the Chinese government in “re-education” camps in Xinjiang. During a public event in New York on September 28, Chinese Foreign Minister Wang Yi (王毅) did not provide a direct response to the question of re-education camps. Instead, he emphasized that the Chinese government’s actions in Xinjiang seek to prevent and curb terrorism, in what he called a “Chinese government action for the good of the common people”. In recent years, much news about Xinjiang is censored, but trickles of information are managing to escape the wall of censorship and reveal to us what is going on in the region. Initium Media had the opportunity to interview a former student in Xinjiang, an ethnically Han Chinese individual who studied the Uyghur language. He said one of the most common career paths for graduates of his program is to assist in the government’s efforts to monitor the Uyghur people. During his time in school, he was obligated to take political training classes as well as write ideological reflections on a weekly basis. He also had to hand over his phone and laptop to authorities for inspection every month. The Xinjiang I experienced when I first arrived and the Xinjiang of today are completely different. Before I studied there, I heard that it was a place with many strict rules, but I was only slightly worried. When I first arrived, nothing seemed too inconvenient either. The situation became increasingly complex and tense in 2016, when more checkpoints and inspections of all kinds began. Security at school became perversely strict. Students had to swipe IDs at school entrances, classroom buildings and residence halls. There were room checks at our residences every night. Things were manageable for ethnic Han Chinese students. If you forgot to bring your ID card, you could ask your roommate to send a picture of your student ID by phone. But this was definitely not the case for Uyghur students. Checkpoints in the city of Urumqi in general became very strict. There was almost one check point after every five steps, visible every couple hundred metres. At the Erdao Bridge Grand Bazaar—a famous commercial center in Urumqi—you would encounter cops walking on the street. The police would stop you to inspect your phone, regardless of whether you are a Han Chinese or an ethnic minority. The Grand Bazaar in Urumqi. Antoine 49/Flickr. We needed to pass security clearance even in shopping malls, not to mention airport terminals and train stations. In areas such as shopping districts, there were armoured cars parked at every street corner and mall entrance. Special force police officers carrying big guns were on patrol everywhere. I saw more armoured cars and tanks in Xinjiang than I had ever seen in my life. Also in Xinjiang, there’s no 4G internet. Only 3G internet is available, and the internet speed is really slow. I was quite annoyed by things like this, because they greatly affected the level of convenience in my daily life, although I could do nothing to change the situation. Many of my classmates in Xinjiang wanted to leave the region. As of now, it’s not difficult for Uyghur students to leave Xinjiang. But it’s very hard for them to leave China and go abroad. China now has a “Backbone Plan for Ethnic Minorities”—a policy which gives Uyghur students a much lower score threshold for graduate school applications in comparison to applicants who are of Han Chinese ethnicity. However, this policy requires you to return to Xinjiang after you have completed your master’s degree, probably because the government does not want to see a brain drain of human capital in the region. In fact, even if Uyghur individuals succeeded in leaving Xinjiang, they still faced great difficulties every step of the way. I had a classmate of Hui ethnicity, who went to Shanghai for a concert. The Hui are also a Muslim majority ethnic group, but predominately speak Mandarin Chinese. Because her personal ID card was registered in Xinjiang, police suddenly barged into her hotel room for inspections at 2am in the morning. As a young girl, she started crying on her bed as the police officers came in. If this is the case for members of the Hui ethnicity, the treatment of Uyghur people can only get stricter. Even in the city of Urumqi, people of other ethnic minorities from other parts of Xinjiang have a hard time finding places to rent. The difficulties apply to both the tenant and the landlord. If the tenant is of an ethnic minority, the landlord will often receive calls and inquiries from the police. Perhaps this has left many tenants with no choice but to return to their hometowns. When I used to volunteer as a teacher in a village, I met a Uyghur teacher at the local elementary school who graduated from a top Chinese University. He had very qualified credentials, but he was only able to teach in a small village, perhaps due to the limitations associated with his ethnic identity. Schoolyard in Kashgar, Xinjiang. rcmar/Flickr. Even though many intend to leave Xinjiang, most students from an ethnic minority background are unwilling to go through the troubles associated with this desire. Graduates of my school’s program generally have an easy time finding well-paid jobs within Xinjiang. After graduation, students who head to Southern Xinjiang, such as the cities of Kashgar and Hotan where Uyghurs outnumber Han four to one, it’s possible to secure a monthly income of more than 5,000 RMB ($720 USD). People who work for the public security sector at the autonomous regional level, which is equal to the provincial level, can earn more than 10,000 RMB ($1,440 USD) every month, fresh out of school. The cost of living in Xinjiang is not very high, so this level of income can guarantee a very comfortable life. I think the most horrible thing about school was our weekly political education. I had never learned so much politics in my life. Since first year, the whole school would gather for political studies on a weekly basis for an entire afternoon. The content of political studies included newly published reports by national leaders, news updates from various provinces and ministries, as well as reports from official media channels. All materials were read aloud to us by teachers sitting at a podium. After listening to the lecture, we also had to produce a report on political thought, which ranged from 1500 to 2000 characters. The reflections first described what we have learned from the lecture, and then reflect upon whether we encounter the issues that were raised in class. For example, have you recorded or saved any video or audio files of violent and terrorist activities? Do you have the inclinations of being a “double-faced person”? This refers to people who support Party policies on one hand while simultaneously and secretly supporting extremist thought. We wrote the most about this notion of being a “double-faced person”. Moreover, during the first few days at the beginning of every semester, we had to study politics and write reflections, in replacement of the normal curriculum. To be honest, the content that we were taught was quite boring. While lectures are happening from the podium, many of us sitting down in the audience would fiddle with our phones during these speeches. We had a total of three thick textbooks, which mainly documented the foreign visits, remarks, and new policies of our political leaders. We had to write reflections after each day’s teachings, and produce a general summary after the holistic process of political training is complete. We really felt a sense of desperation. This whole process is inherently very routine but without much substance. The written reflections felt meaningless, since we would just copy each other’s writing anyways. Not only did we as students have to learn, the teachers also had to learn to. Before the beginning of each semester, the teachers had to engage in a week-long political learning program before classes officially started. The number of teachers was much smaller than the number of students, which made it much harder to slack off when listening to lectures or writing reflections and reports. “Sanjin”, or three entries, means that teachers must enter the cafeteria, student residence, and classroom with their students on a weekly basis. “Liangliao”, or two conversations, requires teachers to chat with not only the students, but also with their fellow teachers. “Yijiaoyou”, or the notion of “one socializing”, refers to the guideline that every Uyghur teacher, including our principal, should maintain frequent contact with the students by communicating over WeChat. Initially, we were not required to hand in our phones and computers for inspection. Starting in 2016, we were asked to visit the Department of Student Affairs every month with our phones and computers. We took turns between the different classes, lining up to turn in our devices and wait. If they found no issues after checking our devices, they would cross our names off on a chart before we could leave. Using a data cable, they would connect our phones and computers to their laptop, which is also connected to another device that I do not know the name of. Not only were our devices inspected, it was also mandatory for us to install “internet cleansers” on our phones, and submit a screenshot as proof that the application was downloaded. Basically, the Department of Student Affairs can see everything in our phones and computers. I am always unwilling during these inspections, because I feel like they are an infringement on my privacy. There was one time when my classmate deliberately locked his phone before submitting the device for inspection. As a result, the Department of Student Affairs returned the phone, and asked him to re-submit the phone after unlocking it. 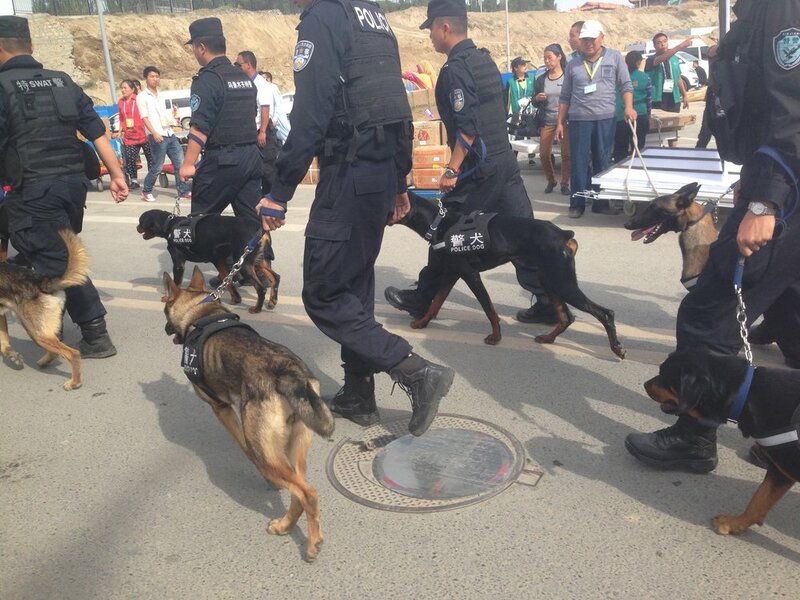 Police Tactical Unit officers and police dogs on the streets of Urumqi, Xinjiang. Voxeros/Flickr. In this regard, I think our college is a “severe disaster zone”, because many graduates go on to partake in highly sensitive and politically strict work. For example, if you studied the Uyghur language, you cannot even have the slightest “incorrect” ideological beliefs. One of our teachers just returned from time abroad, and his phone was shut down for a month because it contained software and applications from overseas. Relevant authorities also confiscated his phone for a week-long inspection, and changed his phone number before returning the device to him for normal use. We’re also not able to exchange with outside academics. Frankly, as a student of Han ethnicity, I was not worried that I would be brought into the re-education camps. My main fear was that my teachers would suddenly disappear. This was the case for one of our teachers, who was teaching one day, but then gone the next. Students sought to ask where this teacher went, but they were told by other teachers that they should not ask. Later, we learned that this teacher was taken to the re-education camp because he owned real estate in a Middle Eastern country. Basically, if you enter the camp, your political career is destroyed, and it is very difficult to say whether you will be able to return to your position as an educator. I also know another Uyghur parent, whose child was studying in a Middle Eastern country. He was brought to the camps because he had a record of financial transfers to this Middle Eastern country. Not only are the Uyghur people in a difficult position, we Han people are also in a dilemma. Everyone at our college must submit their passports at matriculation, regardless of ethnicity. When you need to leave the national borders, you will then apply separately to get your passport back. One of our teachers has a child who is studying abroad, but the teacher cannot go overseas, and nor can the child return. The limitations are enormous. I heard about all this before I enrolled in school. As a result, although I had already applied for a passport at the time, I did not bring it to school. I am a student from outside of Xinjiang, so passport management for us is relatively less strict, and it’s alright if you do not want to submit your passport. Police Tactical Unit officers on the march in Kashgar’s city square. Antoine 49/Flickr. But this exception certainly cannot be made for local students from Xinjiang — they must submit their passports. Of course, regardless of whether or not you hand over your passport, your immigration records are still searchable to the authorities. To be honest, during my years in Xinjiang, I did not encounter any extremists. After all, extremists would not tell me that they were extremist anyways. But I did meet very devoted Muslims. A boy who usually loves to eat will not even swallow his saliva during times of fasting in Ramadan. In my experience, Uyghur communities are indeed very afraid of ethnic integration. Normally speaking, Uyghur individuals are not allowed to pursue inter-ethnic marriage with individuals of Han ethnicity. When ethnically-Uyghur actress Coulee Nazha (古力娜扎) and Chinese actor Zhang Han (張翰) were dating, many members of her ethnicity criticized her for being “shameless” or “conscienceless”. Within the Uyghur community, internal divisions are very serious — people with higher levels of education tend to be more open. A Uyghur teacher who instructed at my IELTS examination preparation course spoke great oral English, had a comfortable familial background, and received high-quality education from a young age. He believed that many Han practices and habits were agreeable. I used to tutor a young Uyghur girl. Her mother was a government employee. She was not at home for one week every month, because she needed to go to Southern Xinjiang as a part of her job duties. Every Uyghur that works for the government is obligated to make this monthly week-long visit, where they act as mentors to Uyghur families in Southern Xinjiang, and teach them skills such as literacy and handicrafts. At the time, I chose to major in the Uyghur language largely due to the employment rate in this field. People outside the region may not know, but we have a huge advantage when it comes to post-graduate employment. Big internet technology firms like Tencent and NetEase are actively recruiting students from our program. On Chinese soil, aside from Mandarin-speaking WeChat users, the largest demographic group on WeChat are people who speak the Uyghur language as their mother tongue. Today, when sending WeChat audio messages, the Han language (i.e. Mandarin Chinese) can be directly outputted as text. This service is not yet available for the Uyghur language. Students from our major can work on phonetic segmentation and improve the recognition rate of the Uyghur language on WeChat. On NetEase Cloud Music, a Chinese music platform, there are relatively few songs in the Uyghur language, and if we were to work at NetEase, we could help enrich the Uyghur song collection. However, the Uyghur language major is only open to students who do not speak Uyghur as their first language. All the teachers in our program are Uyghur by ethnicity, but the students are all from other ethnicities. Other than tech companies, the best way out for students in the Uyghur language major is employment in various provincial police and state security departments. These positions usually involve surveillance and supervisory work, and the subject of such work is naturally the Uyghur people. Police and state security departments in many provinces across the country will come to recruit recent graduates, including those within the region of Xinjiang. The Khorgas Port in Ili and the Sinkiang region in Southern Xinjiang have the largest demand for such supervisory functions. An armoured car in the streets of Urumqi. Andrew An/Flickr. Since many of the graduates in the program go on to do sensitive work, their ideological activity is under the intense state scrutiny. The Autonomous Regional Government is also very supportive of the Uyghur language program. If one chooses to pursue graduate studies, the annual tuition is only around 5,000 RMB. Students also receive an annual subsidy of more than 10,000 RMB, which is a grant that does not even include scholarships. The national government also heavily subsidizes our school. So on one hand, the state strictly supervises our school, and on the other hand, it generously supports the school with subsidies, and I feel like this counts as a measure to win us over. This year, graduates from the Uyghur language major have a new direction for employment. The national government just released a new policy that every three students of an ethnic minority background must be assigned a counsellor. So many post-secondary institutions are now recruiting from the Uyghur language profession, in search of counsellors for Uyghur students. For this position, the most concrete criteria for recruitment is political clearance. The candidate must be a member of the Communist Party to qualify. I now slightly regret selecting this major. In fact, my marks were pretty good, and possibly good enough to obtain an institutional endorsement for graduate school admissions. But I gave up in the end because I feel like I really could not continue studying this major. I desperately did not want to stay in Xinjiang, which is why I left the country to go abroad. Banner image courtesy of Roy Cheung/Flickr.